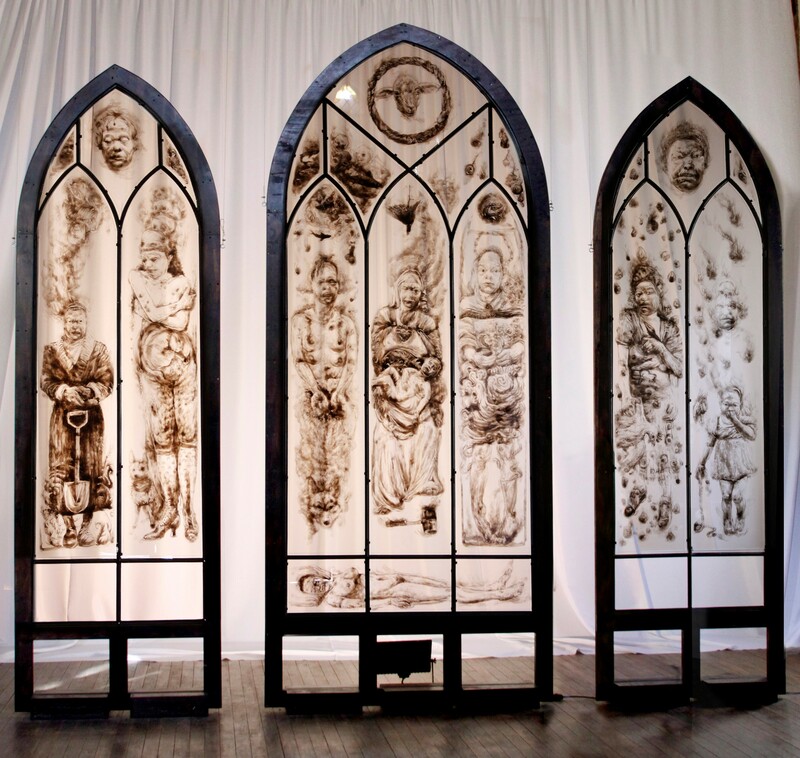 No Country For Old Women, Diane Victor’s monumental triptych in glass and smoke. Photograph supplied. When it comes to shock and horror, religion is a magnificently fruitful reservoir for metaphors ad images, which lend themselves to being fabulously twisted to digress toward sexual and political overtures. Karen von Veh, Professor of Visual Art at the University of Johannesburg clearly had a lot of fun in researching and putting together this exhibition which tears strips off religious, in particular, Christian art. It also celebrates the wonder and value of South African art: many of the works draw from private collections or are really complex to move and exhibit; in many ways, this was a once-in-a-lifetime chance to see several of these pieces in a gallery context. As you walk into the space, you are confronted, from across the trajectory of the whole gallery space, with massive side-by-side portraits of Jesus Christ and Osama bin Laden: faces that each in their own way, led to worlds being set on fire. You get the urge to bypass everything in the show, to rush up to these works and drink them in. Coined collectively as ‘Communist and Socialist’, the diptych is by Conrad Botes, and embraces both a hard-edged drawing skill, and a sophisticated sense of choreography with irony. The faces are made of a plethora of quasi pornographic and devilish cartoon figures that override and underplay the iconic status of both of these men. The works stretch your understanding of what it means to mythologise a character as they hit you in the solar plexus. There are several other pieces on this show by Botes – two beautiful extrapolations on the Cain and Abel story which, a la Kierkegaard and his rhetoric around Isaac and Abraham in his Fear and Trembling, force you to think considerably more about the perspectives and biases in the stories you may have been privy to since you were a small child. Jacki McInnes’ Wife’s Lot presents the monumental rotundity of a kneeling female form cast in heavy salt. It’s a play on the biblical tale of the woman married to Lot, who never was named in the bible, but who disregards God’s injunction not to look at the destruction of Sodom and Gemorrah and thus is turned into a pillar of salt. It engages, too, with the heaviness of patriarchy. It’s a very fine work indeed: the artist has developed the metaphor of a woman in a farm labour context, in a drawing using burnt tyre soot and oil on paper, which is also exhibited, but this piece is less convincing than the sculpture. While several pieces by Majak Bredell embrace an understanding of the role of the virgin in the material, which stretches from Eve to Mary, they’re loud and brash and resonate with other mythologies around goddesses. Above all, they clash almost crassly with the considerably more subtle and responses by artists of the ilk of Diane Victor, Wim Botha and Christiaan Diederichs. Indeed, Victor’s monumentally important triptych, No Country for Old Women, drawn with smoke on glass, is a work that takes your breath away. Not only is it a complex and sophisticated engagement with socio-religious and personal issues that organised Christo-centric religion throws up for Victor, but it is also immensely beautifully made. You would get the urge to kneel in front of the piece, were it not for its almost arbitrary positioning. It feels morally wrong to be able to look through this work and see bits of UJ’s campus, or the underside of the gallery’s pelmets. . There are many pieces de resistance in this troubling and dramatic show, but perhaps the strongest and most riveting – and controversial – piece is Wim Botha’s Commune: Suspension of Disbelief, a work which the artist created in 2001 as part of his Standard Bank Young Artist award show of that year. The piece comprises a rendition of Jesus Christ suspended from the cross. Only there is no cross holding the figure, which is made of hundreds of bolted-together bibles in different languages, and carved beautifully, from this idiosyncratic medium. As you walk around this delicately wrought figure, you understand how the pages of the texts are made to form the substance of the body. It’s the kind of work you have difficulty in pulling yourself from, in a contemplation of both incredible beauty and mind-boggling confrontation of dogma. Replete with humour, sadness, magic and naivete, the exhibition’s primary strengths are in the more solemn and more subtly controversial pieces, which are often in danger of blowing your mind – casting images that will stay with you forever. “Deconstructing Dogma: An exhibition of transgressive Christian iconography in South African art” was curated by Professor Karen von Veh and was shown at the UJ Art Gallery, during May 2014. Dear Robyn, thank you for reviewing the “Deconstructing Dogma” exhibition at UJ this past May. I would like to counter your characterization of my work as loud, brash and crass, with an explanation of my intention. I do not embrace a particular understanding of the virgin as such as much as I subvert that notion by insisting on her sexuality, as in the diptych, “Annunciation” in which her fingerprints are left on the feathers of the winged messenger, suggesting a sexual union rather than the biblical version of sexless conception. In the “Eve-not guilty” and “Magdalene-not guilty” diptych I vindicate these two figures by these titles from the web of sinful sexuality that the church had spun around them in its centuries-long endeavor to suppress female sexuality and thereby keeping women in their place. While “Earth Madonna” and the triptych, “Black Madonna” allude to the goddess, I herein request the viewer to consider the possibility of the divine child as female. In “Living Cross” I use the figures of a copulating Sun and Earth to supplant the familiar tortured man. The books, “Black Madonna” and “Queen of Heaven” both give Mary pre-historic and ancient ancestry by standing her on the shoulders of earlier goddess figurines.